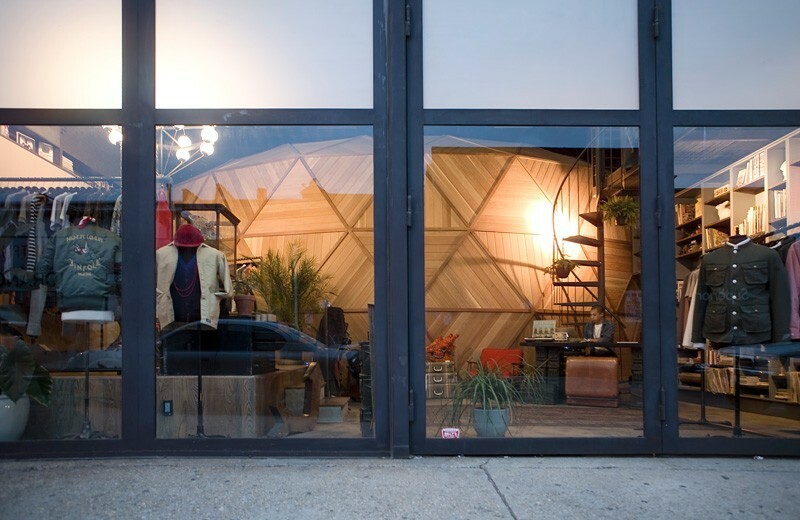 Architect John Berg has transformed a former mechanics garage into a multi-functional event/performance space, bar and retail store in Brooklyn, NY, for creative collective Kinfolk Studios. 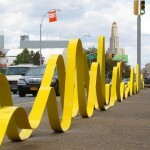 The project is located in the Wythe Avenue corridor in Williamsburg Brooklyn, a slowly gentrifying neighborhood composed of mostly low rise industrial buildings which support local manufacturing. 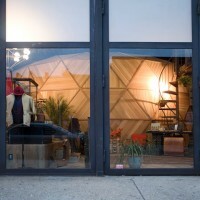 The corridor is also home to Kinfolk Studios. 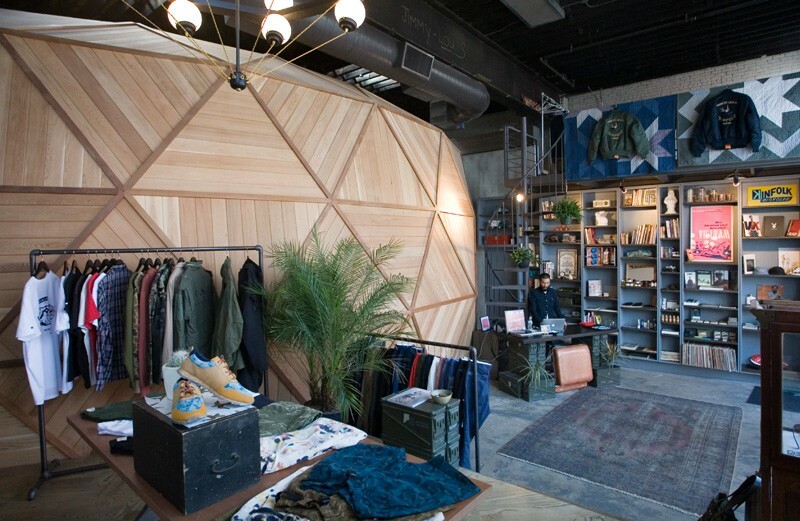 As an organization, Kinfolk is a creative collective that uses their space at 90 Wythe Ave for various functions not the least of which are coffee shop, bar and restaurant. 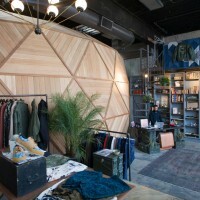 Kinfolk was formed in 2008 by friends from New York, Los Angeles and Tokyo, Japan. The concept of a “Kinfolk life” evolved from their desire to create products and experiences they’d imagine but couldn’t find to purchase. Combining experience from a variety of disciplines, the group set out to source the highest quality designers, builders and techniques to develop lasting products and unique experiences. For the neighboring site at 94 Wythe Avenue, we were hired to design a multi-disciplinary event/performance space, bar and retail store. The existing building, a former mechanics garage, is an existing 75’ x 50’ brick structure with 20’ tall ceilings and storefront glazing facing Wythe Avenue. 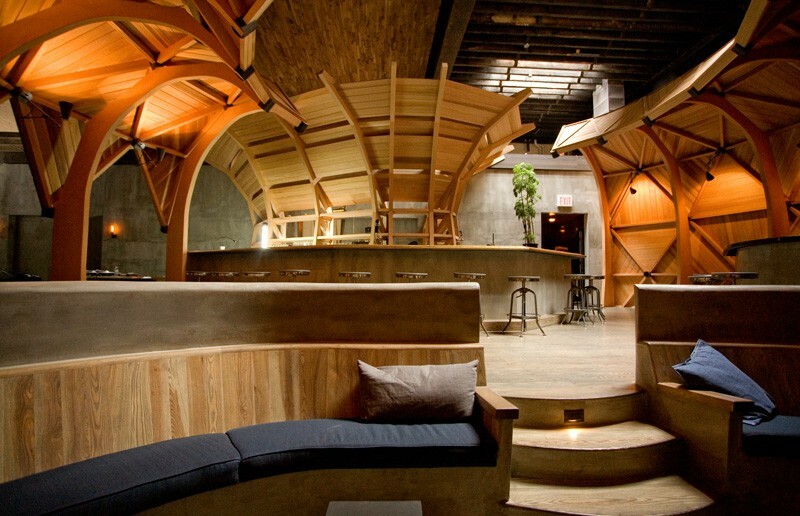 As a design directive the client asked that the space look like it was designed by a “Pacific North West hippie Mathematician”. The bar area had to feel intimate on a slow night with only 30-40 people but feel connected to the rear event space when the venue is filled to capacity with 150 people. 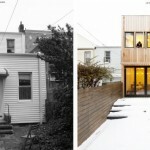 Our intervention also had to have a strong visual impact when seen from the street. 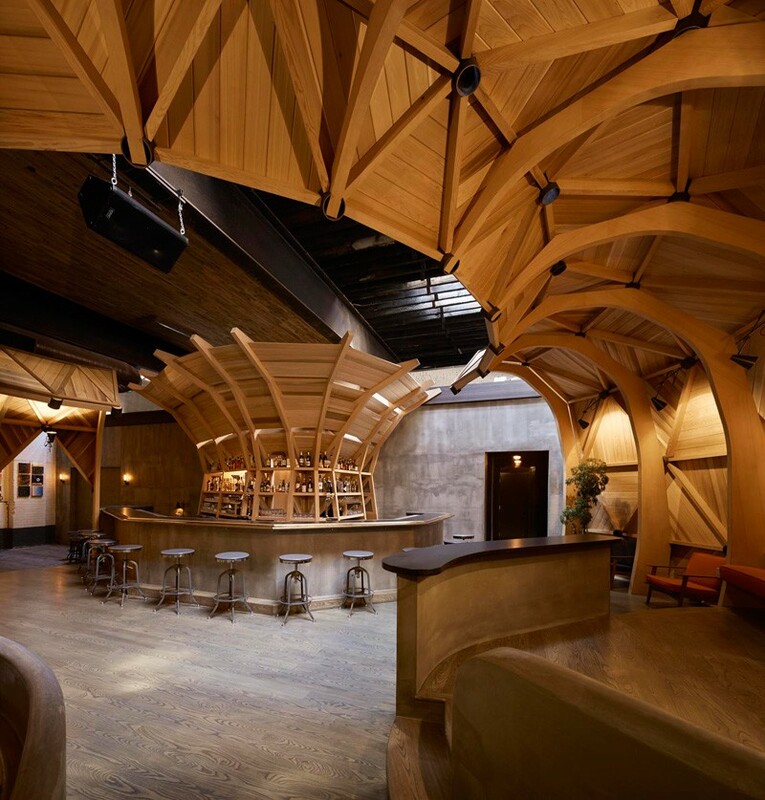 Lastly, the bar and event space needed to be adaptable to a variety of uses including art gallery shows, movie screenings, DJ dance parties, musical performances and large dinner parties. We arranged the service areas ( bathrooms, kitchen, refrigeration room, storage) in a linear bar along the North side of the building. In the middle of the main space we inserted three set pieces; two “geo – shells” and the bar canopy. 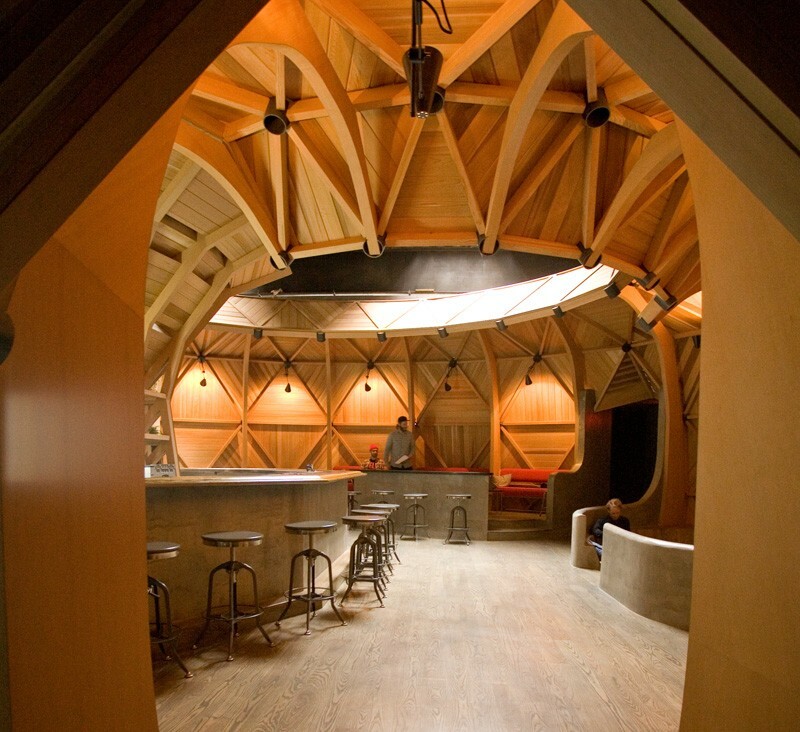 The geo -shells are geodesic inspired sections of a dome (homage to the hippie mathematician) and are clad in douglas fir and Western red cedar to materially reference the Pacific North West. 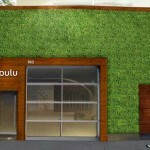 The retail space utilizes the glass store front system for display and has a designated street entrance. 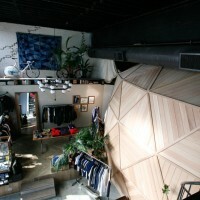 The experience from the street is that there is an entire geodesic dome in the space. 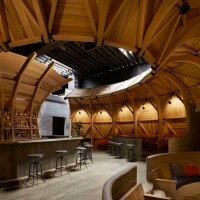 One enters the bar/event space through an intentionally dark entry hall which is angled at the end to only reveal the interior space of the “dome at the end of the hallway. 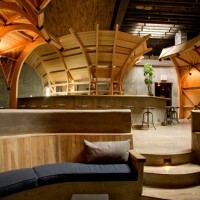 Upon entering, the bar structure is the visual focal point and a foil to the geo-shells. 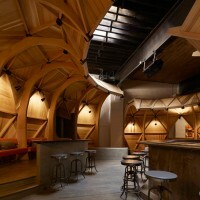 The bar structure’s trusses support the liquor bottles and the canopy which spatially defines the bar area. 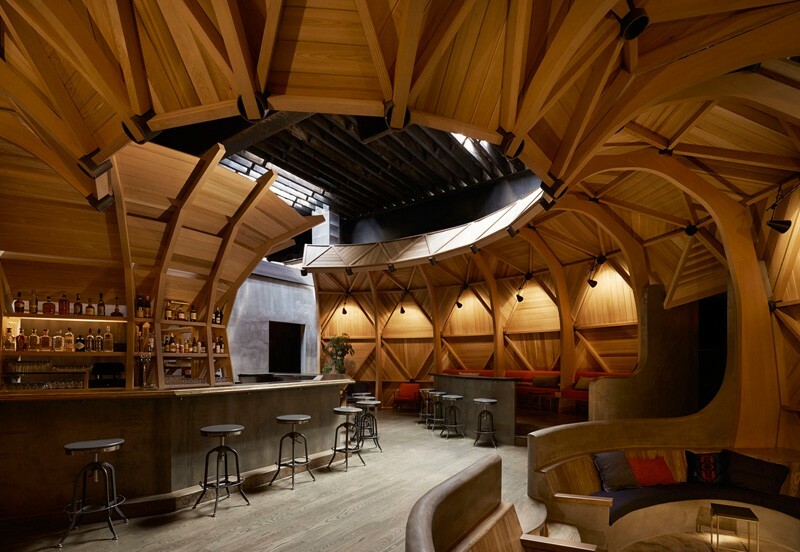 Both geo-shells while slightly different in scale and radius create semi enclosed spaces with intimate seating areas differentiated by changes in elevation; one seating array is slightly raised while another is recessed into the floor referencing George Nelson era “conversation pits” . The feeling of closeness inside the dome is regulated further by lighting control. The geo shell in the rear of the space is carefully perforated to connect to the rear event space which contains a small stage, DJ booth and gallery lighting. 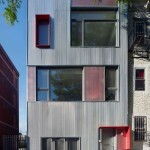 Removable panels were designed to infill the openings in the shell and modulate the level of connection between the two spaces.